This is my first Top Ten Tuesday post, yay! 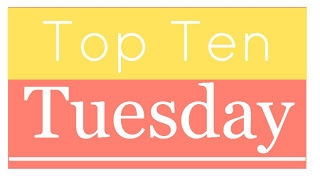 Top Ten Tuesdays are hosted by The Broke and the Bookish and this week’s topic is Top Ten Books I’ve Read So Far in 2013. This is a tough one because I have read so many good books already! 1. The Dream Thieves by Maggie Stiefvater–I cannot describe how unbelievably excited I was to get an ARC of this at BEA 2013! The Raven Boys was one of my favorite books from 2012 so I had high expectations for this one. Stiefvater managed to surpass those expectations and leave me even more excited for the next one. I’ll be posting my review of The Dream Thieves this summer! 2. The Elite by Kiera Cass–another book I had been highly anticipating. The Elite was one of those books that I literally could not put down until I had finished it. I love how America has grown through the series so far and I’m excited to see how this trilogy wraps up. 3. Scarlet by Marissa Meyer–another great sequel! I like how Meyer is able to retell a fairytale but completely reinvent it at the same time. I loved how Scarlet and Cinder’s stories overlapped and I’m excited about the rest of this series. 4. The Madman’s Daughter by Megan Shepherd–this was a fascinatingly creepy story that I absolutely loved! I’m so glad that there is going to be another book and I can’t wait to see how much more twisted it gets! 5. The Darkest Minds by Alexandra Bracken–this book reminded me of X-men but still had its own originality. I really enjoyed this and I’m excited to read the sequel! 6. Dark Triumph by R.L. LaFevers–I loved the fact that this story was told from Sybella’s point of view and I honestly liked her story more than Ismae’s. Sybella had a haunted past that deeply affected her and it was amazing to see how she was able to overcome all of that and fight back. 7. The Archived by Victoria Schwab–this was definitely one of the most original stories I’ve read in awhile. The main character travels through doorways to hunt Histories, which are basically human souls that need to be returned to their dead bodies that are filed away in the Archives. This was a mix of spooky, mystery, and the supernatural, and overall a fascinating read. 8. Asunder by Jodi Meadows–this book continued the incredible story of Ana, a Newsoul born into a world of souls that reincarnate. It was a great sequel to Incarnate and I honestly have no idea how the series will end, but I’m sure it will be amazing! 9. Shades of Earth by Beth Revis–this was such a great ending to the Across the Universe trilogy. Revis is excellent at world building, and the world she builds in Shades of Earth is both horrific and incredible. 10. Through the Ever Night by Veronica Rossi–I’m so glad that I finally got into this series! I love Aria and Perry and I was so glad that we got some more of Roar and Liv’s story in this book. I’m eager to see how it will end! What are some of your favorites from 2013 so far? Did any of these books make your top ten as well? SO MANY AMAZING BOOKS!!! Wish I could’ve read all of them as you did *sigh* I’m read The Raven Boys now, DAMN, I’m loving it so much! I haven’t read Shiver or The Scorpio Races or any of Maggie Stiefvater’s works but you sure bet I will 😉 I have Through the Ever Night on my list too, I thought it was even better than Under the Never Sky! So many good books that I still have to read! The only one I’ve read from the lot is Dark Triumph which is in my list too! Great list – I had TTEN and Dark Triumph too! Most of these are on my TBR, I’m glad you loved them! I’m actually reading The Elite right now. 🙂 Great list! Lovely list! You’ve included so many sequels I haven’t gotten to yet, which makes me excited – The Dream Thieves, Scarlet, and Through the Ever Night! The Madman’s Daughter is on my TBR list. Great picks! Kiera cass made my top ten too, but with the Selection. The Elite made top 15 🙂 Great list!